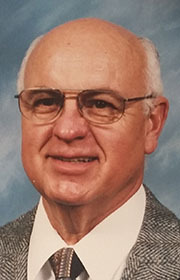 George “Nick” Drzy­cimski, 83, of Fort Dodge passed away Thurs­day, September 6, 2018 at Friendship Haven. Funeral services will be 10:00 am Monday, September 10, 2018 at Laufersweiler-Sievers Funeral Home and 10:30 am at Corpus Christi Church with Msgr. Kevin McCoy officiating the Mass of Christian Burial. Burial will follow at Corpus Christi Cemetery. A visitation will be Sunday, September 9, 2018 from 3:00 to 6:00 pm at the funeral home with a Rosary at 6:00 pm. George Nick Drzycimski was born on June 29, 1935 in Fort Dodge. He grew up in Fort Dodge and graduated from Fort Dodge Senior High School. He then attended Iowa Central Community College graduating in 1965 all while working full time to support his wife and five children. On May 30, 1953, he married Ann Estlund at Corpus Christi Church. He was employed at Gus Glaser Meats for 20 years, and then became a Federal Meat Inspector for 10 years and retired from the Fort Dodge Postal Service after 15 years of service. He belonged to the American Postal Workers’ Union. He enjoyed spending time with his family and friends, tending to his flowers, watching wildlife, and antiquing. He was interested in genealogy and was very proud of his heritage. He enjoyed a pet dog and many cats throughout his marriage. He loved travelling all over the United States and other countries. He especially enjoyed his trip to England, Scotland, and Ireland. He belonged to Corpus Christi Church his entire life. He and his wife Ann formed the first Questers Couples Group known as the, Gypsum City Questers more than 30 years ago in Fort Dodge. He was active in Boy Scouts and was a Scout Master at Grace Lutheran Church for five years. Nick is survived by his wife, Ann Drzycimski of Fort Dodge; daughter, Sherry (Ed) Anderson of Webster City; sons, Dr. Nick (Pam) Drzycimski of Fort Dodge, Scott (Kim) Drzycimski of Fort Dodge, Mitch (Lori) Drzycimski of Gilbert; 13 grandchildren, Terry, Cindy, Julia, Ryan, Tyler, Kara, Alex, Maria, Kylie, Emma, Cole, Joseph and Jessica; 7 great-grandchildren, Gabriela, Payton, Max, Josh, Fei Fei, Oliver and Jack; three sisters, Rita, Mary Jean, and Rachel. He was preceded in death by his parents, Joseph and Rachel (McElroy) Drzycimski; youngest daughter, Cindy Drzycimski in 1976; siblings, Robert, Miriam and Betsy. In lieu of flowers, memorials may be left to the family’s discretion.